Sometimes you need to execute multiple test cases at same time to save test execution time. TestNG has very good feature to execute test cases/classes In parallel to each other means you can execute two different test cases In two different windows of same browser simultaneously. If you remember, We have already learnt how to execute two different tests In two different browsers(Example : Firefox and Google Chrome) simultaneously In THIS POST. Now let us try to Implement test classes parallel execution practically. Supposing I have two calc test classes as Test_One.java to sum values and Test_Two.java to subtract values as bellow. Each having two different @Test methods. I wants to execute above given selenium webdriver test classes simultaneously. For that, I need to prepare testng.xml file as bellow. You can VIEW LINK LIST OF TESTNG ADVANCED TUTORIALS. In above testng.xml file, I have used parallel="classes" that means testng will execute both test classes(Test_One.java and Test_Two.java) In two different thread/browser window. thread-count="2" parameter describes maximum number of threads allowed In execution at same time. Run above example and observe console result at the end of execution. It will looks like bellow. 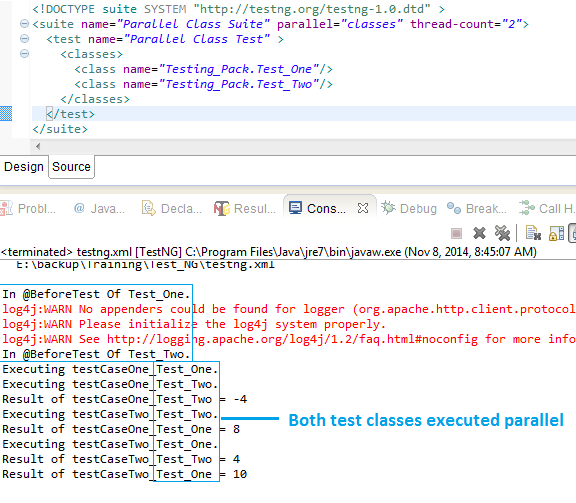 As per console result, Both test classes executed parallel In two different threads. Nice Post and useful. Thank you so much. Hi, If i keep thread-count value greater than 2 in testng xml file code then will it effect anything in script execution?? Is it thread count equal to number of tests or classes that we want to run? ?